So, as you know, a friend of mine and I have decided to become writing buddies for each other. Each week we phone conference and talk about any triumphs or tribulations, brainstorm where needed, and help set weekly goals for the up-and-coming week. re-read my middle grade novel to become better acquainted with it. It's been a while since I've read it from page 1 to page 85. It's also been about a month since I've worked on it seriously and I feel reading it will help freshen things up. While reading, take notes for improvements for the next draft. But no messing around with it this time. I keep changing and making big edits and I believe this is why I haven't finished. Make a daily schedule with my kids so I can include time to write my novel, time to view houses and write my copies (the freelance work I do), and time for us to have fun together or with their friends. So far I have already tackled number three. It felt good to have the girls be a part of this planning and they felt good to have input into our summer. A win-win situation. I always struggle in the summer because there is so much I want/have to do. I want to write. I have to work. I want to be with my girls and have fun together. When I write, I feel guilty I am not with them. When I am working I feel guilty I am not with them. When I am with them, I feel pressure I am not writing or working. So coming up with a schedule showed all of us there is plenty time in the day to do all three. I am going to be waking up early and getting my creative writing done while they are still sleeping. They have a more relaxed bed time in the summer which means they are sleeping later in the morning. Plus, it is vital for us writers to know what time of day we are most effective. I write best in the morning. I must write as soon as I wake up and keep at it till lunch - during the school year, that is. In the summer I won't write until lunch, but this way, at least I still write in the mornings for two and a half hours and the house will be still and quiet - another necessity. The bonus is, I won't be riddled with guilt that I am not with the girls because they will be sleeping anyway.Then we decided on a two hour chunk of time they would want me to do my copy writing and what activities they can do while I work. Life lesson #679: it's never fun to go through the pain and struggles of life, but you always come out the other side with the most growth and learning. Afterall this is what we do to our MCs too, right?! Great advice! If we could come out of all our conflicts as good as our characters, that would be worth writing about! So happy you have a great plan which will work! Thanks PJ. And I must say I am inspired by you and your top five lists. Lists do make us accountable, don't they? And posting them makes it even more so. Wish me luck! The summer is also the toughest time for writing in my house. I hadn't thought about sitting down with the kids and planning a schedule. Great idea! And thanks for the visit. :) I'll copy your url so I can link to you on Wed. Thanks for playing! I linked you to mine too. I visit you again soon and thanks for stopping by my blag as well, Barrie. I think your idea of a writing buddy is fabulous! Not a critique group but someone you need to be accountable to. I hope I can find someone willing to do that with me! Dawn, thanks. I think it will work out. But it really helps if your writing buddy is just as eager as you are about finishing. I know Cathy wants to finsh her amazing novel as much as I do. Maybe you can find someone through blogging or your residency program. Do they provide email addresses? You can probably adapt this idea to do via email just as easily as over the phone... Your residency program will be your buddy these next two years. Phew! You have a lot to do! I agree that number three, especially the guilt factor, is the real challenge of summer. Off topic: great photo! Hey Danette, thank. 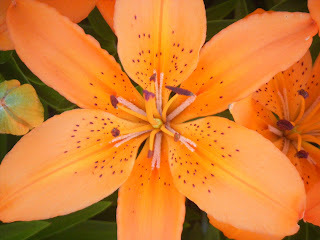 The tiger lilies were especially beautiful this summer. They doubled in size. And my roses were amazing too, but last year they blossomed all summer. This year, they only blossomed once... any idea why??? J'adore les fleurs, trés jolie!!! And great photograph. Sheri, this is a fabdabby plan. You're gonna nail this, I just know it. You're a true inspiration (erven if you may not think it at times) and an incredible talent. I can't wait to see this book in print - for real! Go write Sheri, write like the wind. AH... Je t'aime, tu est un ami très cher, Leeza est merci beaucoup!